Download the spray and use it! Pneu just made a great spray to promote the spray contest. 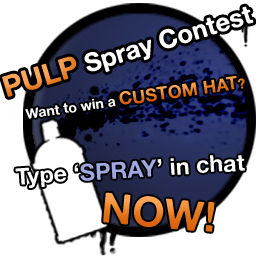 I request the help of every member to promote this contest by using this spray ingame!! You can download it as a zipped vtf + vmt file at the bottom of this post. If any of these folders don't exist, just create new ones, put them in the same order and name them the same as above. Start TF2. Go into options -> Multiplayer. Press the button 'Import spray' and start browsing for your spray. The location of the spray is same as above. (I'm not 100% sure, but pick the .Vtf file in the 'logos' folder. This works for me). Apply the changes and you should be ready to let people all across the TF2 universe know this contest exist!